In January, 2013, NTT Com Asia (NTTCA) installed a telecommunication cable (Asia Submarine-cable Express (ASE) cable) approximately 7,200 km in length, connecting Japan and Singapore with branches to the Philippines, Hong Kong SAR (HKSAR) and Malaysia Marine works for the cable installation was completed in January 2013. The landing site is located at a new Beach Manhole (BMH) and the cable was ultimately connected with a Data Centre in Tseung Kwan O (TKO) Industrial Estate. From Tseung Kwan O, the cable extends westward approaching the Tathong Channel. Near to Cape Collinson, the cable is approximately parallel to the Tathong Channel until north of Waglan Island where the cable travels eastward to the boundary of HKSAR waters where it enters the South China Sea. The total length of cable in Hong Kong SAR waters is approximately 33.5 km. A map of the cable route is presented in Figure 1.1. A Project Profile (PP-452/2011) which includes an assessment of the potential environmental impacts associated with the installation of the submarine telecommunications cable system was prepared and submitted to the Environmental Protection Department (EPD) under section 5. (1)(b) and 5. (11) of the Environmental Impact Assessment Ordinance (EIAO) for the application for Permission to apply directly for Environmental Permit (EP). The Environmental Protection Department, subsequently issued an Environmental Permit (EP- 433/2011) for the Project. In accordance with the EP conditions, an environmental monitoring and audit (EM&A) programme is required to be implemented in order to track the environmental performance of the cable installation works of the Project. 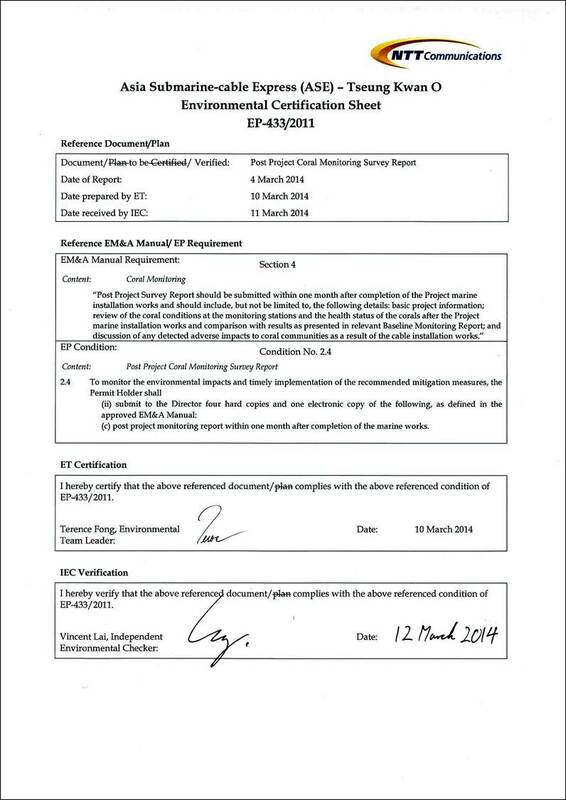 Pursuant to Condition 2.4 of the EP, an environmental monitoring and audit (EM&A) programme, as set out in the Environmental Monitoring and Audit Manual (EM&A Manual) (), was required for this Project. Baseline data were collected prior to the start of cable installation works in 2012 and monitoring and audit were conducted throughout the cable installation and after its completion in early 2013 as required in the EM&A Manual. Upon inspection in October 2013 the ASE cable was found to be damaged and a section within Zone A (see Figure 2.1) required re-installation. 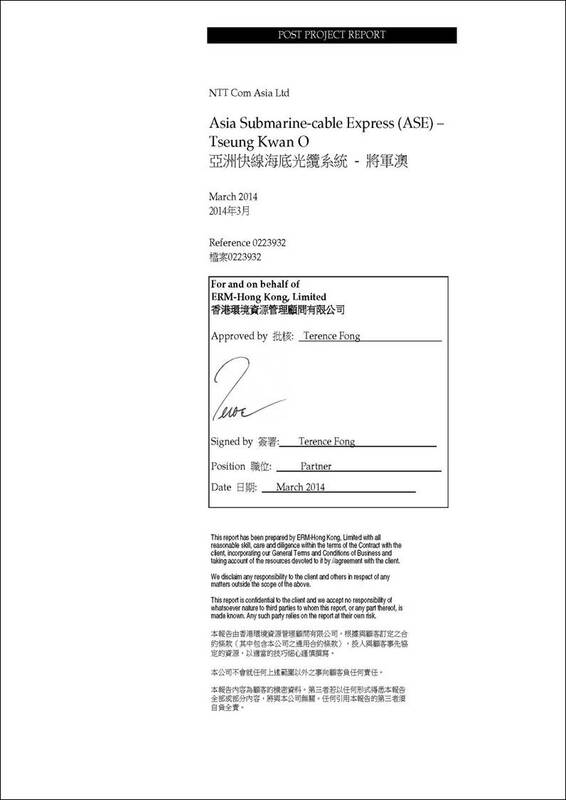 The EM&A programme was therefore required to resume for the cable installation works in Hong Kong Waters (the “Project”) and the EM&A Manual was updated to reflect these new repair works. A new coral monitoring baseline survey (Baseline Update) was carried out prior to the installation of the faulty section of cable in November, 2013. In accordance with the Updated EM&A Manual, a Post Project Coral Survey should be conducted within one month after completion of the marine works in order to determine any detectable changes in coral conditions which may have been caused by the cable repair works that were only carried out in January and February 2014 in Zone A (Cape Collinson). 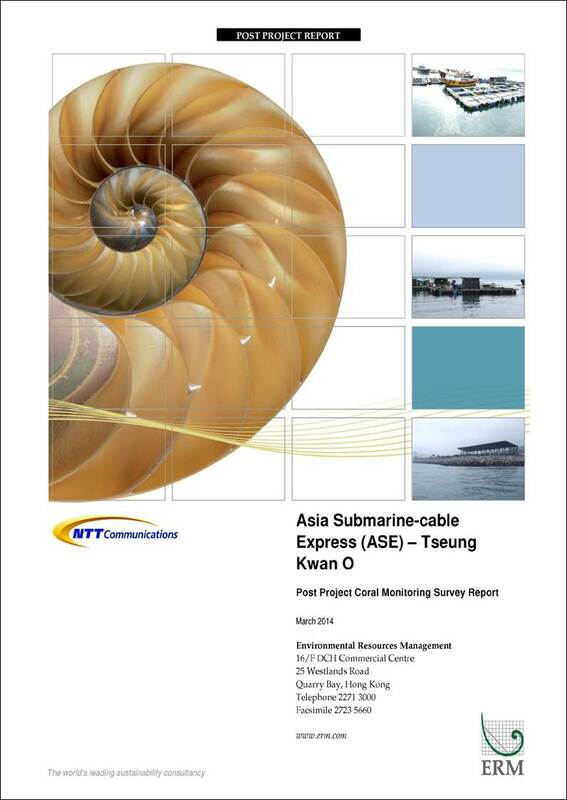 This Post Project Coral Monitoring Survey Report (“the Report”) has been prepared by ERM-Hong Kong, Limited (ERM) on behalf of NTTCA to present the methodology and findings of the Post Project Coral Monitoring Survey conducted in February 2014, after the completion of the marine works for the cable repair works of the Project. Presents the Post Project Coral Monitoring Survey methodology, parameters monitored, monitoring locations and depth in accordance with the Updated EM&A Manual. Reviews the condition and health status of corals at the monitoring station surveyed during the Post Project Coral Monitoring Survey and comparison with previous survey information in order to determine if any detectable changes have occurred between monitoring events. Presents a discussion of the results, comparison to previous surveys and conclusions/recommendations. This section presents the methodology of the Post Project Coral Monitoring Survey conducted in February 2014, which follows that of the original Baseline Survey. The following monitoring locations, shown in Figure 2.1, were surveyed during the 2012 Baseline and 2013 Post-Project Monitoring. Only Zone A was surveyed during the 2013 Baseline Update Survey due to the adverse weather condition and surges at sea. During the February 2014 Post Project Coral Monitoring, however, only Zones A and C were surveyed due to adverse conditions. It should be noted that the repair works were only carried out in Zone A (Cape Collinson). A standardised semi-quantitative REA survey technique was used to investigate the general conditions of the coral communities--including any scleractinian (hard), alcyonacian (soft) and antipitharian (black) corals found--associated with subtidal hard bottom habitat at survey site. The REA technique allows collection of semi-quantitative information on the ecological attributes of the subtidal habitat in a relatively simple way without compromising scientific rigour. This technique is the standard practice for EIA and EM&A marine ecological surveys in Hong Kong and has been modified from the standardised REA survey technique established for the assessment of coral communities on the Great Barrier Reef () for marine environment of Hong Kong (). Following the laying of the transect line, coral specialists swam along the transect and conducted the REA survey. The REA methodology encompassed an assessment of the benthic cover (Tier I) and taxon abundance (Tier II) undertaken in a swathe ~ 1-m wide, 0.5 m either side of each transect, due to visibility limitations. Further explanation of the two assessment tiers implemented during the survey is presented below. Upon the completion of observation along each survey transect, five ecological and seven substratum attributes were assigned to one of seven standard ranked (ordinal) categories (Tables 2.1 and 2.2). § Other benthos (e.g. sponges, ascidians, bryozoans, etc) recorded to genus level wherever possible but more typically to phylum plus growth form. Each taxon in the inventory was ranked in terms of abundance in the community (i.e. specific to the area surveyed, not within the context of Hong Kong or greater region) (Table 2.3). These broad categories rank taxa in terms of relative abundance of individuals, rather than the contribution to benthic cover along each transect. The ranks are subjective assessments of abundance, rather than quantitative counts of each taxon. Note: (a) The classification of “rare” abundance refers to low abundance (small quantity) on the transect, rather than in terms of distribution in Hong Kong waters. § Species lists, species richness and mean values for ecological and substratum types were compiled. § Physical damage to colonies, tissue distension, mucous production and any other factors indicating to corals were noted in the field. Although coral tagging is a common practice for repeated monitoring of individual colony, this technique was not employed in this monitoring programme due to difficulties in re-locating the exact transect placement and the tagged corals given the generally low visibility in the area and low light conditions in deep water. Instead, colonies of similar growth forms and size were selected. This section presents findings of the Post Project Coral Monitoring Survey. Marine works for the cable repair works were completed on Thursday 6 February 2014 and final confirmation after testing of the cable was given on Tuesday 4 March 2014. Based on experience from the Updated Baseline survey (2013) and previous surveys, coral monitoring is very weather sensitive for this Project, only being possible across all of Zones A to C when the wind is under force 2-3. After marine works completed, the weather forecast was therefore checked and predictions indicated 18 February as the best date to conduct coral surveys, with the weather looking to deteriorate subjequently. To ensure post-project coral monitoring was carried out within three weeks of the marine works completing, the survey was undertaken as soon after marine works completion as the weather would allow. The Post Project Coral Monitoring Survey was therefore attempted in Zones A, B and C on 18 February 2014, being the most suitable date for the dive survey as explained above. Weather conditions were mainly cloudy and foggy, with moderate (Force 3) southeast winds. Mild to moderate swell, surface chop and moderate below-surface surge were experienced. Underwater visibility was relatively high (~7 to 8 m) along the northeast face of Cape Collinson in Zone A and at the southern side of Tung Lung Chau in Zone C. According to the previous survey experience at Tai Long Pai in Zone B during 2013 Baseline Update Survey and 2013 Post-Project Coral Monitoring Survey, coral monitoring at Zone B could only be carried out when the wind force is below 2-3. Moreover, since the above-surface visibility was extremely poor (< 600 m) and strong current was initially experienced at Tai Long Pai in Zone B, this area was considered too dangerous to continue the survey and was abandoned due to concerns for diver safety. Weather conditions were monitored closely for another two weeks after 18 February to find another window to attempt to carry out monitoring survey at Tai Long Pai in Zone B, however, continuous strong northeasterly or easterly wind (Force 5 to 6) were recorded making it unsuitable for any dive survey at Tai Long Pai in Zone B. It should also be noted that Tai Long Pai in Zone B is located at least 5 km from the cable repair works area and being so far away, would not be expected to be affected by the Project works. A detailed description and discussion of the monitoring results from Zone A and Zone C, collected on 18 February 2014, are presented below. Seabed composition along the monitored transects within Zone A and Zone C are presented in Table 3.1. Each taxon in the inventory was ranked in terms of relative abundance in the community and results recorded during the Post Project Coral Monitoring and Updated Baseline Surveys are shown in Table 3.2 and 3.3, respectively. Findings of the REA surveys are discussed below. During the Post Project Coral Monitoring Survey conducted on 18 February 2014, the degree of exposure within Zone A, along the northeast face of Cape Collinson was (3) – semi-exposed, while the south side was (4) – exposed, thus creating moderate surge conditions nearshore. Sediment deposition on the substrate (referring to hard substrates only) was rated as (1) – minor, with only a thin layer of sediment. The seabed along the transects sampled in Zone A was mainly composed of bedrocks, large and small boulders in the shallow depth region (2-5 m CD), with some patches of sand (Table 3.1). The deep depth region of Zone A (A-D1) (beyond 5 m CD) was mainly composed of sand and small boulders. At transects A-D2 and A-D3, it was mainly composed of bedrocks, large and small boulders. Some hard and octocoral colonies were present but accounted for less than 5% cover in shallow depth zone, whereas less than 5% hard coral cover and 6 to 10% octocoral cover were recorded in deep depth zone. Moderate cover by crustose coralline algae was also observed at both depth zones. Tier I results for Zone A are presented in Table 3.1. The estimated percentage covers of the major benthic attributes were similar between the 2013 Baseline Update Survey, 2013 Post-Project Coral Monitoring Survey and 2012 Baseline Survey, which recorded less than 5% hard coral cover in both depth zones, less than 5% octocoral cover in shallow depth zone and 6 to 10% octocoral cover in deep depth zone of Zone A. During the Post Project Coral Monitoring Survey conducted on 18 February 2014, the degree of exposure within Zone C, along the southern face of Tung Lung Chau was (3) – semi-exposed, however due to the southeasterly wind on the survey day, moderate surge was experienced at the monitoring site. Sediment deposition on the substrate (referring to hard substrates only) was rated as minor (1), with only a thin layer of sediment. The seabed of both shallow and deep depth zones sampled in Zone C was mainly composed of bedrocks. Hard coral colonies were present, accounting for less than 5% in both depth zones. Octocoral cover in shallow and deep depth zones were less than 5% and 6 to 10%, respectively. Moderate cover by crustose coralline algae was also observed. Tier I results of Zone C are presented in Table 3.1. The estimated percentage covers of the major benthic attributes were similar between the 2013 Post-Project Coral Monitoring Survey and 2012 Baseline Survey, which recorded less than 5% hard coral cover, less than 5% octocoral cover in shallow depth zone and 6 to 10% octocoral cover in deep depth zone of Zone C.
(b) 0= none recorded, 1=<5% Cover, 2= 6-10% Cover, 3 = 11-30% Cover, 4 = 31-50% Cover, 5 = 51-75% Cover, 6 = 76-100% Cover. Hard coral coverage along the REA transects was less than 5% in both shallow and deep depth zones, while less than 5% and 6 to 10% octocoral cover was recorded along the REA transects in shallow and deep depth zones, respectively. The hard coral coverage recorded during this February 2014 Post-Project Coral Monitoring Survey is similar to that observed during the 2013 Baseline Update Survey, 2013 Post-Project Coral Monitoring Survey and 2012 Baseline Survey. Twelve hermatypic hard coral species (Cyphastrea serailia, Favia favus, Favia rotumana, Goniopora planulata, Favites pentagona, Goniopora stutchburyi, Oulastrea crispata, Plesiastrea versipora, Porites lutea, Psammocora profundacella, Psammocora superficialis and Turbinaria peltata), one ahermatypic hard coral species (Tubastrea sp.) and twelve octocoral species (Anthogorgia sp., Dendronephthya sp., Dichotella sp., Echinogorgia sp., Echinomuricea sp., Ellisella sp., Euplexaura sp., Menella sp., Paraplexaura sp., Scleronephthya sp., Sinularia sp. and Viminella sp.) were recorded in this February 2014 Post-Project Coral Monitoring Survey, compared with the five hermatypic hard coral and twelve octocoral species recorded in the 2013 Post-Project Monitoring. The higher number of hermatypic hard coral species recorded might be due to the higher underwater visibility (~ 7 to 8m) during the current dive survey compared to the lower water clarity (~3 to 5m) during the previous 2013 Post-Project Monitoring, meaning that they were more readily identified in this current survey. Moreover, the placement of transects is not exact in every monitoring event since the conditions at the sites do not allow for permanent transects or any coral colony markers to be placed, so transects may not cover the exact space or the same coral colonies in each survey. Goniopora stutchburyi and Psammocora superficialis were the dominant hard coral species recorded, while Dendronephthya sp., Echinomuricea sp. and Paraplexaura sp. and Euplexaura sp. were the dominant octocoral species found. Results of the Tier II Survey conducted during this February 2014 Post-Project Coral Monitoring for Zone A are presented in Table 3.2. Both hard coral and octocoral coverage were less than 5% along the REA transects in shallow depth zone (2-5 m CD), whereas in the deep depth zone (beyond 5m CD), hard coral coverage was less than 5% and the octocoral coverage was between 6 to 10% along the REA transects surveyed. These results are similar to that observed during the 2013 Post-Project Coral Monitoring Survey and 2012 Baseline Survey. Eleven hermatypic hard coral species (Cyphastrea chalcidium, Cyphastrea serailia, Favites chinensis, Favia favus, Goniopora stutchburyi, Montipora peltiformis, Montipora venosa, Oulastrea crispata, Plesiastrea versipora, Porites lutea and Psammocora superficialis), one ahermatypic hard coral (Tubastrea sp. ), twelve octocoral species (Acanthogorgia sp., Dendronephthya sp., Dichotella sp., Echinogorgia sp., Echinomuricea sp., Euplexaura sp., Leptogorgia sp., Menella sp., Paraminabea sp., Paraplexaura sp., Scleronephthya sp., and Verrucella sp.) and two black coral species (Antipathes sp. and Cirrhipathes sp.) were recorded during this February 2014 Post-Project Coral Monitoring Survey, compared with the nine hermatypic hard coral species, nine octocoral species and two black coral species recorded in the 2013 Post-Project Coral Monitoring Survey. The higher number of hermatypic hard coral and octocoral species recorded in this dive survey might be due to the higher underwater visibility (~ 7 to 8m) during the current dive survey compared to the lower water clarity (~3 to 5m) during the previous 2013 Post-Project Monitoring, meaning that they were more readily identified in this current survey. Moreover, the placement of transects is not exact in every monitoring event since the conditions at the sites do not allow for permanent transects or any coral colony markers to be placed, so transects may not cover the exact space or the same coral colonies in each survey. Montipora venosa, Psammocora superficialis and Porites lutea were the dominant hard coral species recorded, while Dendronephthya sp. was the dominant octocoral species found (Table 3.2). Results of the Tier II Survey during this February 2014 Post-Project Coral Monitoring for Zone C are presented in Table 3.2. Note: *Abundance rating (refer to Table 2.3): 0 = absent; 1 = rare; 2 = uncommon; 3 = common; 4 = abundant; 5 = dominant. The classification of “rare” abundance refers to low abundance (small quantity) on the transect, rather than in terms of distribution in Hong Kong waters. Due to the low water clarity and the strong surge experienced during the attempts for the Baseline Update Survey on 7 November 2013, only 75 m of the Zone A-S2 transect was surveyed. Results of REA Tier II Survey conducted during the 2013 Baseline Update Survey, the 2013 Post-Project Coral Monitoring Survey and the 2012 Baseline Survey are presented in Tables 3.3, 3.4 and 3.5, respectively. 4 = abundant; 5 = dominant. rather than in terms of distribution in Hong Kong waters.